Visitors to Omiyageya can purchase a variety of souvenirs including mementos displaying Okage Yokocho’s most popular character, Okage Dog. The Okage Dog mascot was created to honor the many dogs who long ago made the journey to Ise Jingu along with their handlers on behalf of their owners. These dogs came to Ise in order to receive a lucky talisman called an ofuda from the great shrine. The dogs were recognized as “worshiping dogs” and as such, they were treated well by strangers along the way. After visiting Ise, the dogs then set off for home with their ofudas proudly hung around their necks. Omiyageya also serves as the Okage Yokocho information center and lost property area. There is a first-aid and baby nursing room as well as wheelchair and stroller rentals. 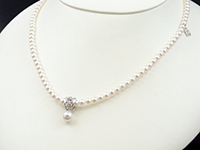 Shiroganeya has a wide selection of silver accessories and jewelry as well as a distinct selection of watches and bead and gem accessories for all ages. 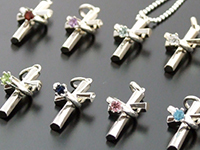 Shiroganeya’s original-designed and unique silver accessories are a great gift for you or someone special back home. World-renowned Mikimoto pearl jeweler operates this branch store in Okage Yokocho which offers their branded pearl jewelry, gift items and original, in-store items. Visitors can choose from a wide array of pearl items that accentuate the beauty and radiance of one of Ise Shima’s finest treasures. Visit Akari no mise if you are looking for a delightful way to create a more relaxing atmosphere in your home or living space. 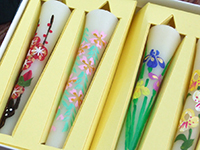 With so many styles and types of candles to choose from such as aroma candles, decorative candles, traditional style Japanese candles and more, the friendly staff at Akari no mise is sure that you can find some candles that suit you or someone special in your life. Tsuboya sells traditional branded Japanese tobacco and lottery tickets. Visitors can purchase various kinds of pipe tobacco giving them a taste of what it must have been like to smoke in times past. And while guests are there, they can try their luck with a Japanese lottery ticket ? they may get some extra fortune after worshipping at Ise Jingu! 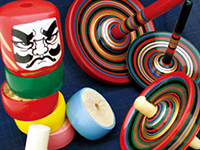 Visitors to Magonoya Santa can find traditional Japanese toys that have a universal appeal for children of all ages. Their toys are crafted with safety in mind and are easy and fun to play with. Locally made souvenir toys from Ise continue to be popular today as they have been for generations. 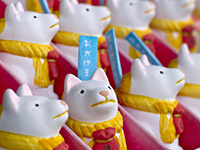 Kicchou Shofukutei sells manekineko (lucky cats) that have been crafted all around Japan. And because Kicchou Shofukutei has such a large selection of lucky cats, it is difficult for visitors to choose which one to buy! Kicchou Shofukutei has a huge selection of lucky cats with all kinds of expressions ? from cute to thoughtful to funny. 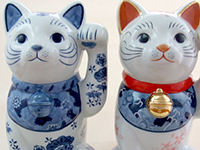 All of their lucky cats are waiting to bring their new owners some good luck. And if any visitors are traveling to Okage Yokocho in the autumn, they should remember that September 29 is lucky cat day so they can join in the fun of the annual festival of lucky cat lovers. 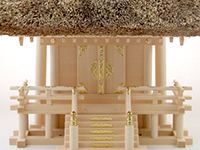 Miyachu has specialized in making household Shinto altars and ceremonial goods for over 70 years. 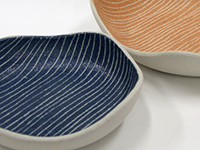 All of their products are made from 100 to 200-year-old hinoki (Japanese cypress) from Gifu Prefecture. Miyachu’s style of craftsmanship is called Yuiitsu-shimei-zukuri, the oldest architectural style in Japan and identical to what is used at Ise Jingu. Throughout the year, visitors can find beautifully crafted seasonal and ceremonial items for sale. Kamijiya sells traditional Japanese craft goods such as wooden chopsticks and toys, cotton handkerchiefs and hand towels as well as letter sets and money envelopes made from traditional Japanese washi paper. In addition, travelers can find various locally-made sundries that are practical for personal use or make great souvenirs for people back home. 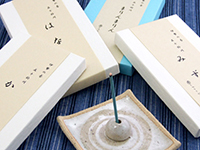 At Kutsurogiya incense shop, visitors can find various types of incense to enrich their daily lives. Kutsurogiya’s original incense is made from all natural ingredients and is one of their most popular items for local people and travelers alike. In addition to incense, Kutsurogiya has a large assortment of incense burners, essential oils, incense sacks, locally produced and hand-made pottery figurines as well as scores of other incense-related goods. 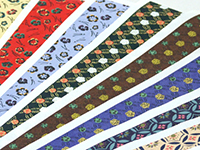 Matsusaka cotton is a locally produced fabric made in the neighboring town of Matsusaka. 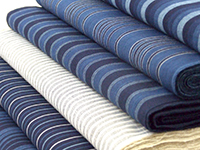 Momenya Ai sells over 150 kinds of beautiful indigo patterned cotton fabrics alongside of hundreds of cotton accessories, coin pouches, wallets, purses, kitchenwares and clothes. Banshakuya Kyubei attracts all kinds of Japanese serious sake drinkers and casual sake drinkers alike. With an impressive selection of over 3,500 different kinds of sake drinking vessels collected from across Japan – from Hokkaido to Okinawa – this is a wonderful shop to explore. 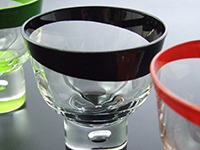 Banshakuya Kyubei sells wooden, pottery, lacquerware and glass drinking vessels for daily use as well as some exceptional vessels that have been crafted by some of Japan’s most prestigious artists. Along with their many drinking vessels, Banshakuya Kyubei also offers a diverse collection of Japanese dishes such as small plates and chopsticks. The theme at Danrantei pottery shop is family happiness through dishes and glassware. Danrantei carefully chooses and sells products made by local artists with the hopes that these items will add to the harmony and good spirits for families around their dining rooms or kitchen tables. Throughout the year, Danrantei holds several special exhibitions so visitors can find new pieces to add to their collections. Danrantei also offers many seasonal products such as glassware items for the summer and pottery items for the winter so you can fashionably decorate your table all year round. The art of making Iga Kumihimo or decorative silken rope, developed over time in the north-central town of Iga, Mie Prefecture. The town of Iga is set in a quiet and peaceful valley surrounded by magnificent mountains and is famous for, among other things, a concentration of ninja culture as well as the birthplace of Matsuo Basho, one of the most famous poets of the Edo period. 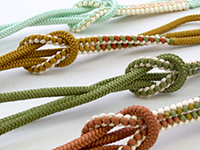 Iga Kumihimo has been historically made as a kimono accessory but at Kumihimo Hirai, visitors can find fun and decorative accessories to fit their daily lives. 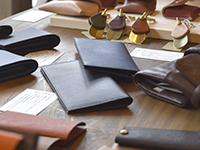 Kaminariya is a store specializing in leather products.